As you all know both of us are interested in the interplay between the social constructs of masculinity with style and menswear. We have been meaning to discuss the relationship in a series of posts for some time now but however many posts we draft, we ultimately do not know quite where to begin. Thankfully a number of designers are posing and examining the questions for us and the resulting collections are full of variety and interest. 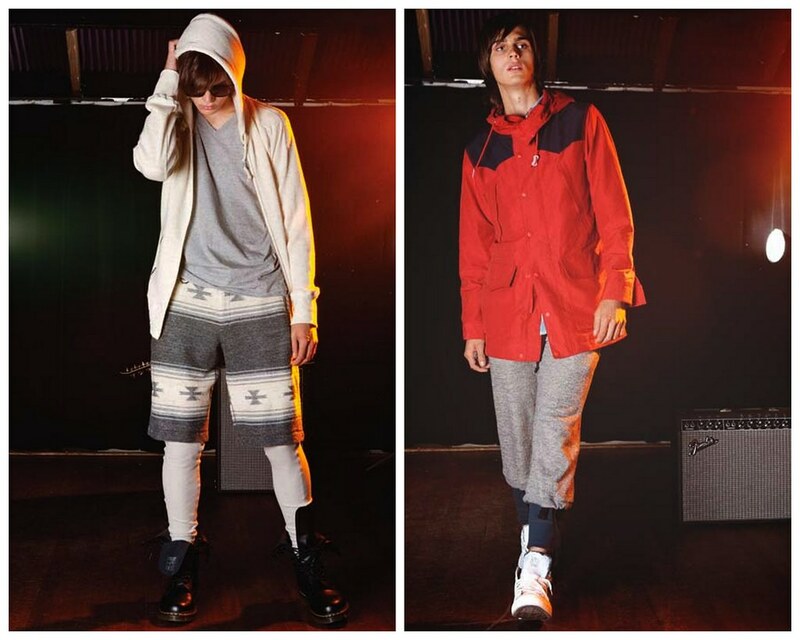 With 1205 Paula Gerbase offers a unique concept of a functional unisex wardrobe – pieces for men and women that can be worn by either. After graduating with a BA in Womenswear from Central Saint Martins she worked for Alistair Carr and Gareth Pugh before beginning her couture tailoring training on Savile Row with Hardy Amies and Kilgour. 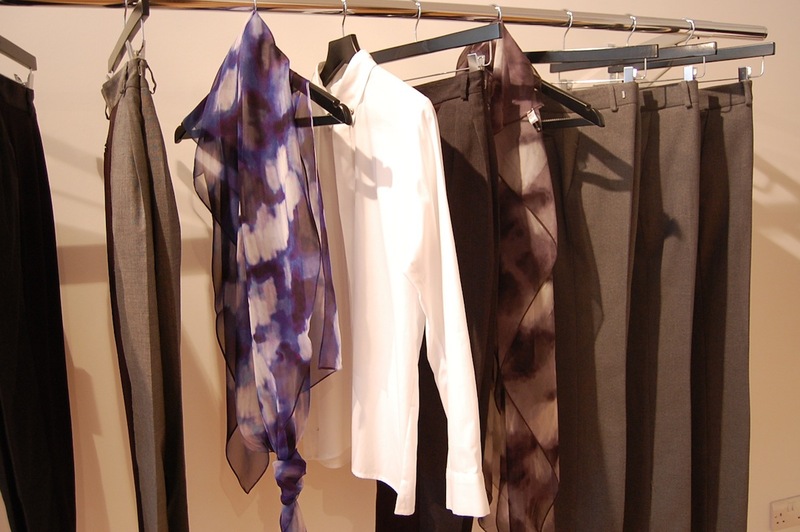 At Kilgour she began a long term collaboration with Carlo Brandelli. After five years working as Head Designer at Kilgour, Gerbase launched her own label 1205 with it's debut collection, 'One', due for s/s10. As a consequence of her menswear and couture training, quality of cut and fabric are paramount in Gerbase’s designs. 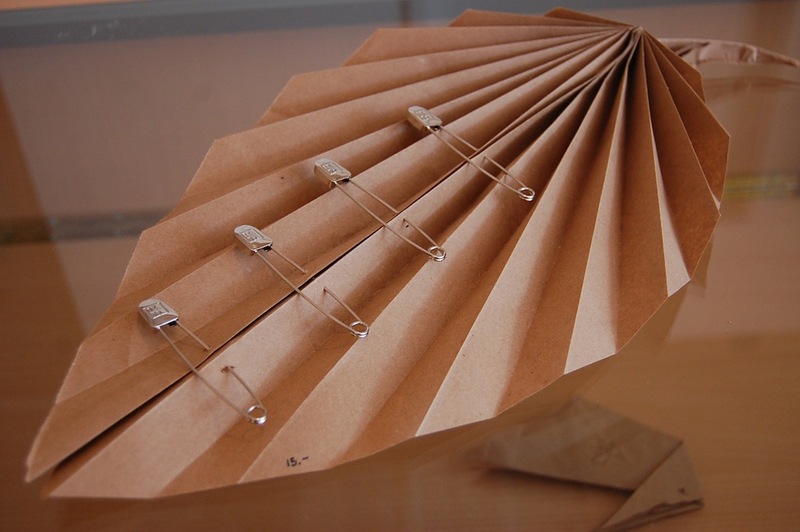 The design process begins with fabric, looking at everything in a microscopic way, resulting in a unique, modern, almost clinical point of view. 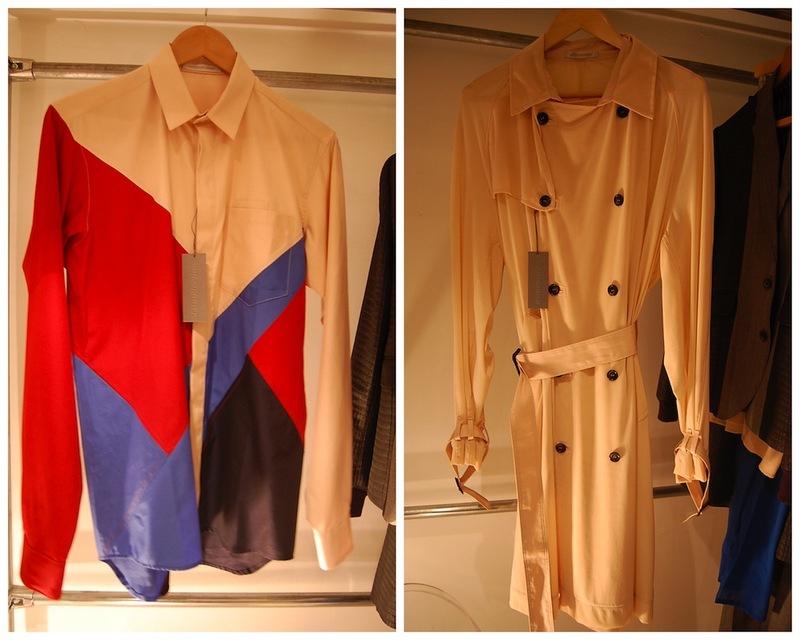 Earlier this week I was invited to see the debut capsule collection of menswear, womenswear and unisex pieces at her store/studio located at Kingly Court (Unit 1.3). Regardless of gender the collection showcases Gerbase’s trademark sensitive use of luxury fabrics and erudite pattern construction for a modern-contemporary muse. While admiring the collection I took the opportunity to sit down with the designer to discuss the label in more detail. Below we talk about how experiences at CSM, working with Alistair Carr and on Savile Row alike influenced her design aesthetic and take a closer look at her designs for SS11. 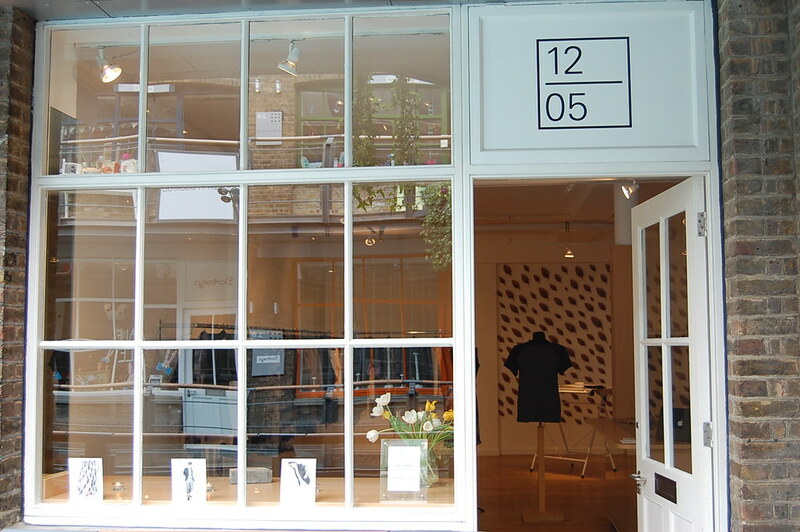 The shop front in Kingly Court. 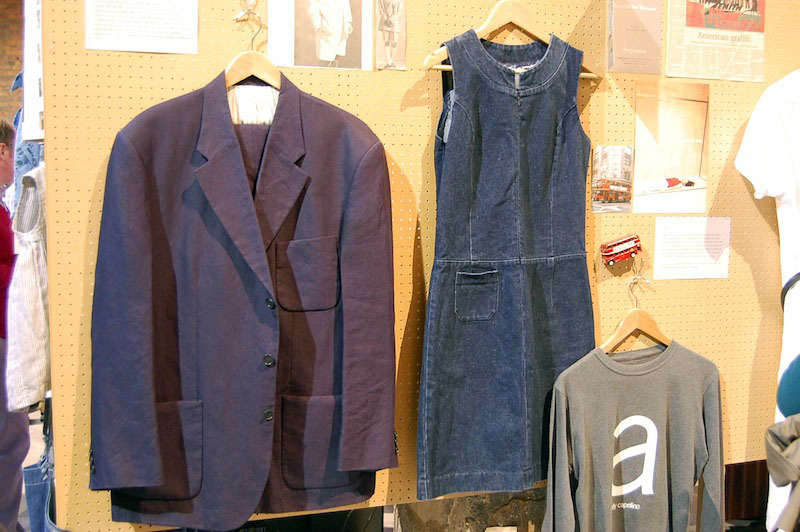 Style Salvage: You graduated with a BA in womenswear from Central Saint Martins, as a student were your collections influenced by tailoring or did this evolve from your internships and through working with the likes of Carlo Brandelli at Kilgour? Paula Gerbase: I actually started working with Carlo two years before I graduated. He needed a second person and he called Willie from Central Saint Martins and she recommended me because she knew I was keen to get in to tailoring and I ended up working alongside him practically full time during my final year. As for my final collection, it certainly had some tailoring influences but I used handmade lace from Brazil. So my tailoring influences were already there during my time as a student. I was interested in getting tailoring experience and learning how to make pieces correctly. I also worked with at Hardy Amies to really learn, they made me sit there and watch for some time before I was able to make anything. Paula makes these origami leaves herself and I just love the subtle branding on the safety pins which are used instead of labels. With the 1205 pin, not only is it completely removable, but it can be placed anywhere the wearer likes. Paula loves the idea of the 1205 customer using the pin to add their own interpretation to the garments. It gives each piece a more personal aspect which is part of their ethos. SS: You have worked with an amazing array of design talent. You worked with Alistair Carr and Gareth Pugh before beginning your couture tailoring training on Savile Row with Hardy Amies. From this, you went on to work at Kilgour - a move which let to a long term collaboration with then Creative Director Carlo Brandelli. What did these experiences teach you? Paula Berbase: My main internship was with Alistair, it was here that I really got involved with the constructive side of things and then I realised that I wanted to get in to tailoring. This decision came at the right time because there was an opening at Kilgour. I started working there for only one day a week because he was unsure whether at first but then it slowly built up to a full time opportunity. So before I was full time at Kilgour, It was at this time that I was also working at Hardy Amies and I would work here for the rest of the week from nine until five. As my workload at Kilgour began to increase I did less and less at Hardy Amies. All of these experiences have really helped form my design aesthetic. At the beginning I could never have known that I would become so closely involved in tailoring but people have always told me that I can be quite severe, so in a way I knew tailoring would be right for me because of the way I think. it just fit. 1205 was a natural progression from what I had learned in pure tailoring and menswear and going back to my original passion. Paula Gerbase: 1205 is simply the day I was born! Some people have asked me why I don't say 'Birthday' because they think it means the same thing but it doesn't ....your Birthday is a day that happens every year and usually means a party and lots of people calling you etc etc etc... A big fuss which I don't like! 'The day I was born' only happened once, and to me it signifies the beginning. A fresh start, which was what this project was supposed to be to me. Also, the reason I wanted to have only numbers is because of my slightly complicated history. Born in Brazil, German mom, Italian dad, traveling around with them during my life living in different places, learning different languages I wanted something that meant the same thing in all languages and everyone could in fact say in their own language so it became personal to each person. 'Douze - Zero - Cinq' in French or 'Tolv - Null - Fem' in Norwegian etc etc. One of the real standout pieces from the collection is this tailored cardigan (available from oki-ni as well as 1205 directly). SS: So that was the driving catalyst behind launching 1205? Paula Gerbase: I certainly wanted to return to the more feminine side of things but to still keep my masculine element. The idea of a unisex wardrobe was very important to me. I think if something is well made and the fabric is great then it should not matter whose wearing it. Paula Gerbase: Yes, completely. I'm not interested in the strict rules of tailoring as such. For example that a pocket needs to be in a specific place, or there at all in some cases. I understand what they are but I don't necessarily have to follow them. SS: At the end of the day rules are always there to be broken or should at least be tested. Paula Gerbase: It is quite freeing not having to follow them actually. 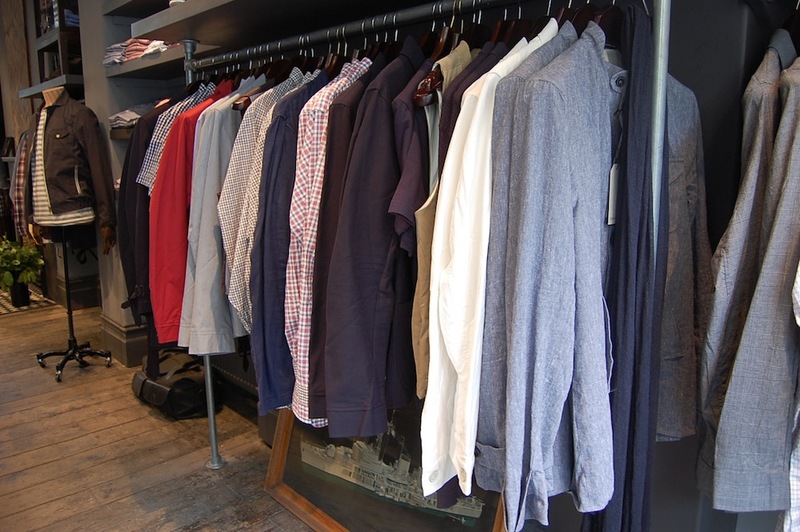 One of the rails in store, blurring the lines between the sexes. 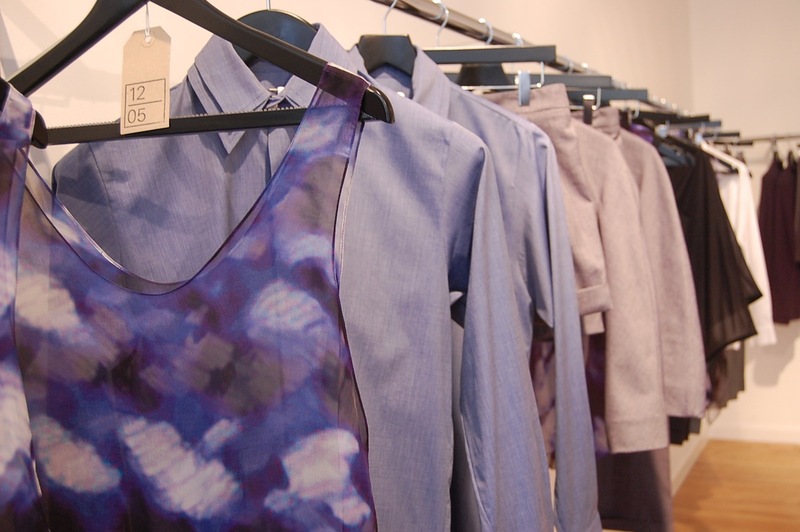 SS: Are you conscious of pieces lending themselves more obviously to menswear or womenswear? Paula Gerbase: I tend to see it as a collection over anything else. For the SS10 collection it is more feminine and for AW10 it is more masculine but the both just happened that way, both felt right. With the AW10 I took the decision to shoot it on a female model only because so many people have questioned the idea of a unisex piece and I wanted to surprise people and it will hopefully make people that bit more open. I like the idea that people might be confused a little at first because it means they are thinking about it. For me, it is great being able to play with fabric in a menswear way for women and it is nice to experiment in a womenswear way with cutting. Paula Gerbase: I find it really surprising, I always thought people were more open minded. For AW10, if you see each piece you might assume that it is menswear but it can be worn extremely well by women also and I wanted to demonstrate that in the look book. Of course there are quite a few people like yourself who get it straight away, for others it might take a little time. I've just tried to push it because I feel it is right, at least for this. The reaction of journalists is always interesting. They are not quite sure where to put us really. They try to put collections in to boxes and we do not necessarily fit them. 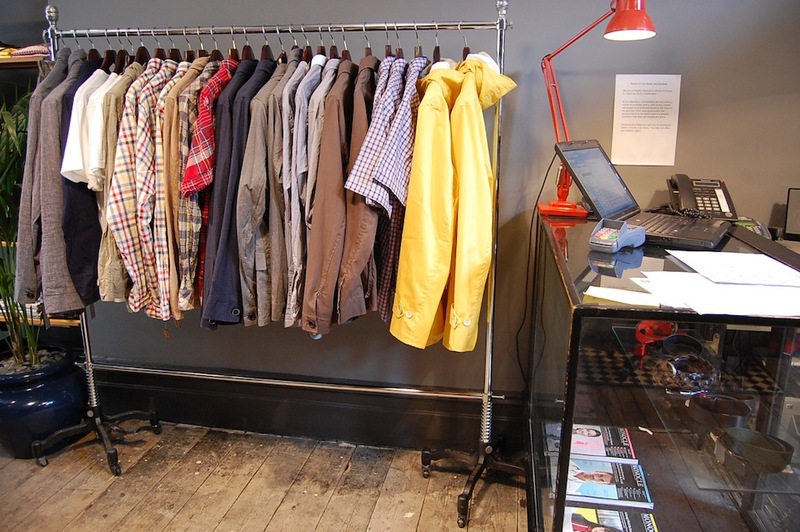 Buyers tend to place us in menswear but that is mainly because of my history. The customer is always more open to experiment with the pieces. SS: In terms of SS10, this is actually the first time I've seen it in person but the importance of prints and lightweight tailoring hits me straight off. What are the other themes running through to the collection? Paula Gerbase: Comfort, playing with colour and mixing fabrics. For example using jersey and cotton in trousers, adding a jersey back makes them so much more comfortable. 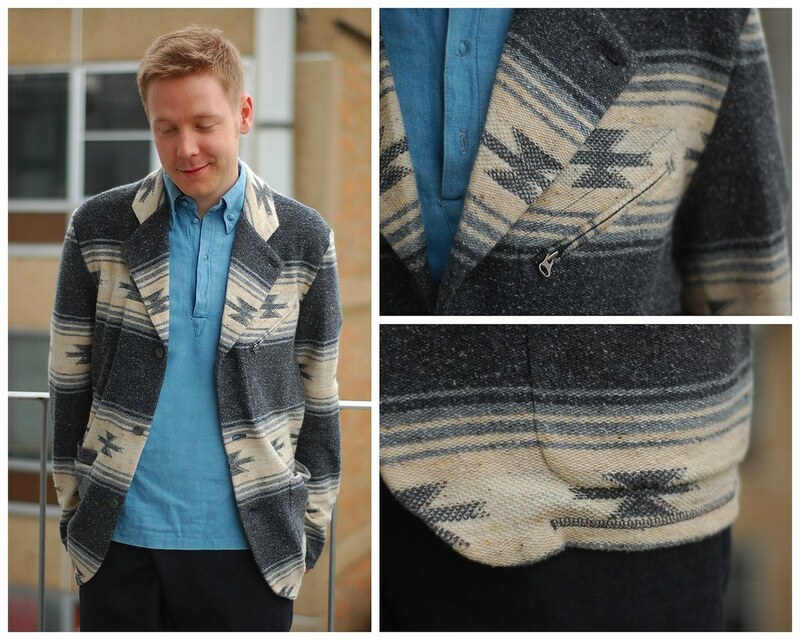 One of my favourite pieces is the tailored cardigan which is unstructured and hangs loosely with no fastening. It has shoulder pads but is extremely lightweight, it has piping but there is no fastening. SS: At this point of the year I am always searching for my idea of a perfect Spring/Summer jacket and this is perfect. It is a wonderful example of relaxed tailoring. Paula Gerbase: A formal jacket is great but this is so comfortable . I wanted to design pieces that could be thrown on. To still ensure that the wearer was dressed appropriately while the pieces feel so light. I enjoyed playing with jersey and cotton throughout the collection. 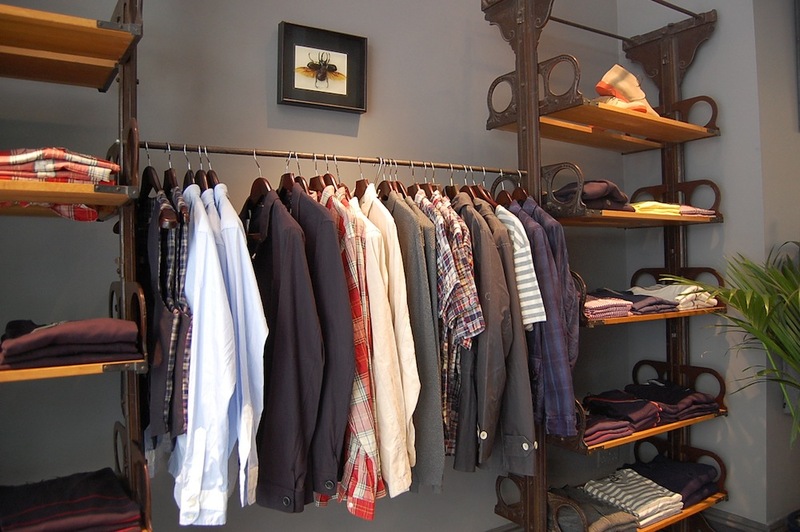 SS: One of the great things about having your own store like this one is that you can see how customers react to your clothes. Since the opening how have you enjoyed the experience? Paula Gerbase: I've never had a store before but I enjoy it very much. As I'm always working here as well people were a little tentative coming in at first but it is quite odd for someone to be shopping in and around someones work environment. It is fun seeing people discover the store. Plus the set up of the store allows customers to ask questions about the pieces directly to me which is great. Initially we had more female customers because we opened without a number of pieces because we were still waiting on some of our garments to be made, as we produce everything in the UK it can take a little longer but since we've had all of our stock on sale and introduced a male mannequin to the display we've actually had more men coming in. I've been pleased by how guys have reacted to the collection. I love watching customers pick out pieces to try on without even asking me if they are meant for men or women. It makes me so happy because it proves that I'm on to something. Paula Gerbase: As much of it as possible takes place here in London. It just felt right. I love the idea of having a transparency in the way in which we work and this involves how our products are made. I enjoy working with craftsmen, I can spend hours talking to someone about a stitch or fabric construction and it is great being able to see them in London and to talk through pieces with them. They can give me suggestions, I'm not selfish in that way at all, in fact I enjoy bouncing ideas off with them. 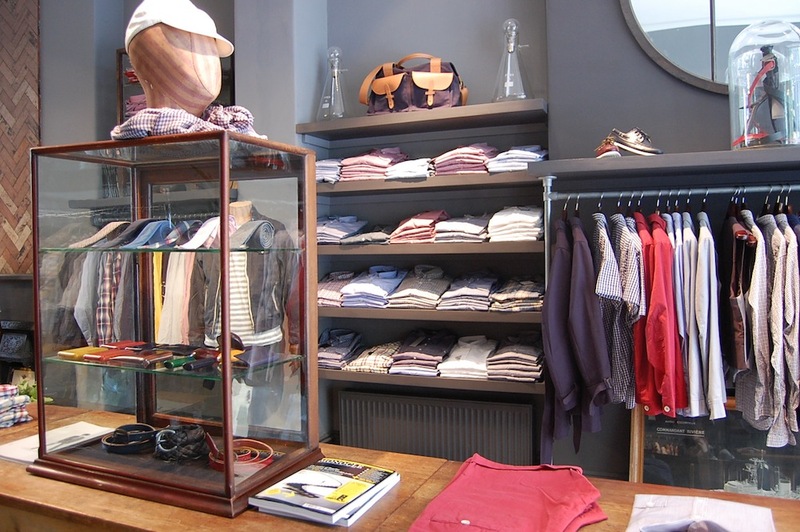 SS: We have such a great history of tailoring here in London but it is seen as a dying trade in some quarters. So it is great to see a new brand embrace it, use it and to learn from these craftsmen. Paula Gerbase: Definitely. 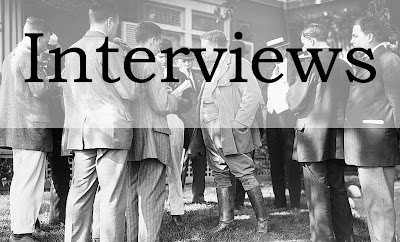 I'll do a lot of the cutting but there are times where I'll have a question and I go back to cutters on Savile Row because those are the people that I know and we'll work on something. There are younger people coming through, whether or not they stay there depends upon the number of opportunities. 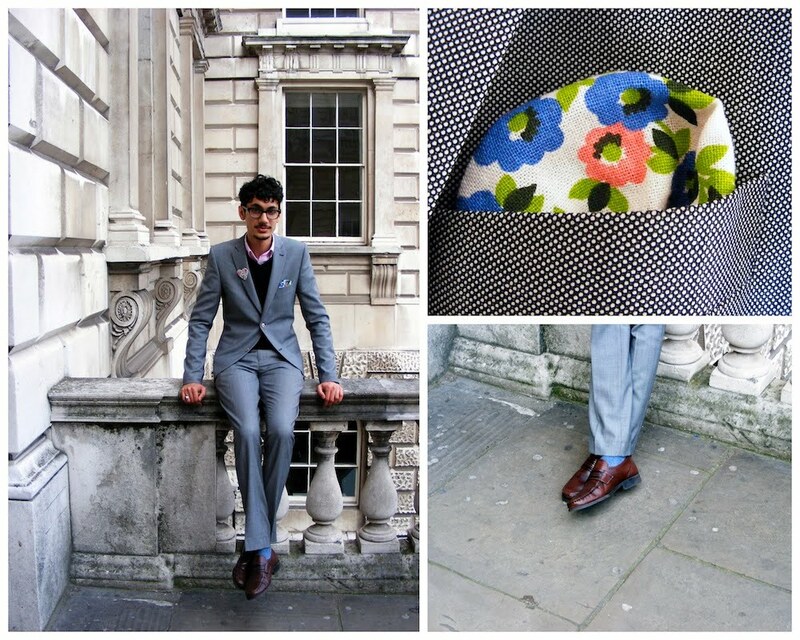 It is great working with the mix of people drawn to Savile Row. SS: And where are the fabrics sourced? Paula Gerbase: They are English and Italian. I have really good relationships with certain mills that I worked with at Kilgour and I just really enjoyed working with them. I used to design the fabrics at the old place, it was nice to continue these relationships in a different way with this line. 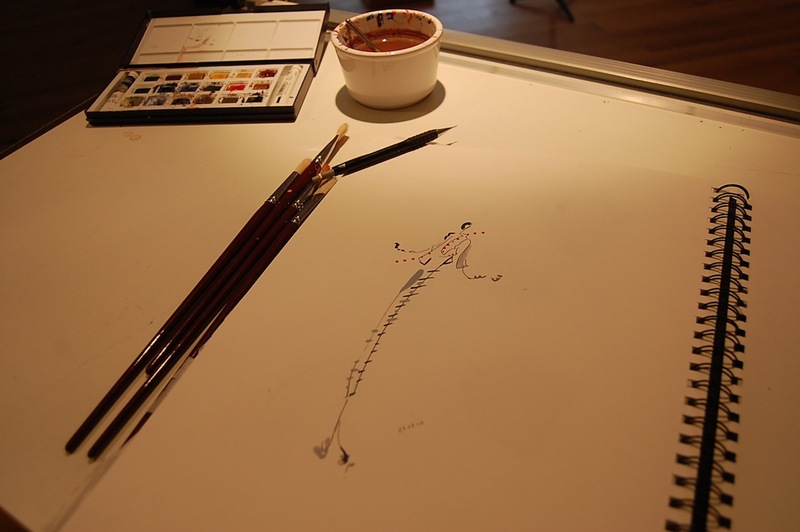 In the middle of the shop floor is Paula's workstation and she let me take a quick peep at her beautiful sketches for SS11. Customers frequently ask her to sketch them something on the spot. SS: How do you see brand evolving over the coming few seasons? Paula Gerbase: One of the most obvious differences between menswear and womenswear collections is that womenswear can shift, swap and change with each season but menswear tends to be more gradual in its development and this is more attune to how I work. I want to push the idea of cut and playing with fabric and textures. While Susie was grounded in New York for an extra week due to the Volcanic Ash billowing out of Iceland she used her time wisely by visiting a number of designers at their studios, experimented with a spot of DIY and even went shopping...for me! I think you'll agree that this is the best type of shopping. So, when I finally saw her huffing and puffing down our corridor followed by more luggage than she left with she was was excitedly clutching a bag from Aloha Rag. Her excitement soon erred towards apprehension as she handed me the bag as doubts whether or not I'd like it began to creep in...the words "If you don't like it, I'll have it" rang out as I tore open the bag like a spoilt brat on Christmas morning. As I discovered the unstructured patterned knit blazer inside her concern soon evaporated as I let out some exclamation of joy. The present that Susie can borrow but not steal off me. 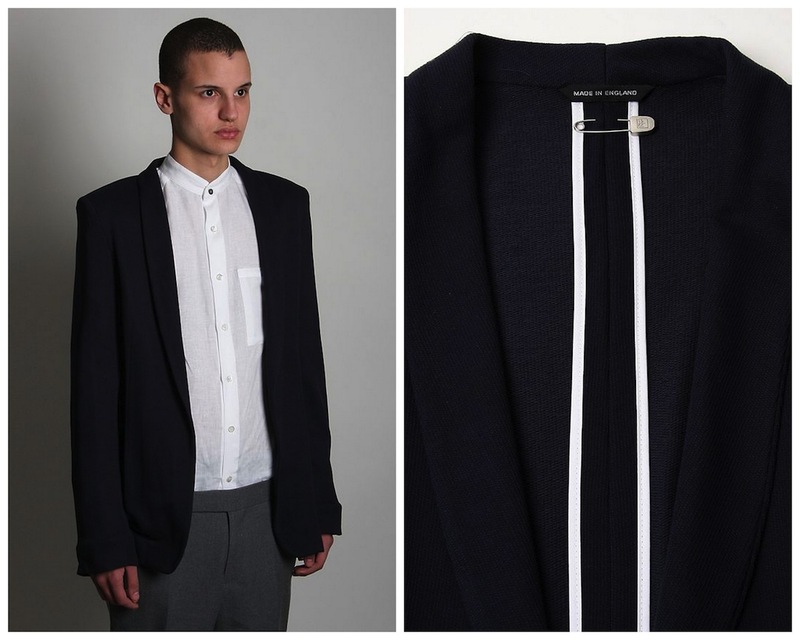 KZO Knit Unstructured blazer worn over Silver Spoon Attire shirt and wool trousers by Unconditional. I had only recently become aware of KZO after stumbling across them on oki-ni while searching for the perfect pair of casual shorts for the (hopefully) warm months ahead. This wonderful gift made me dig a little deeper on the brand. KZO might be based in the Arts District of Los Angeles but there is a distinctively Japanese aesthetic that is intertwined with and seen through a US West Coast lens. 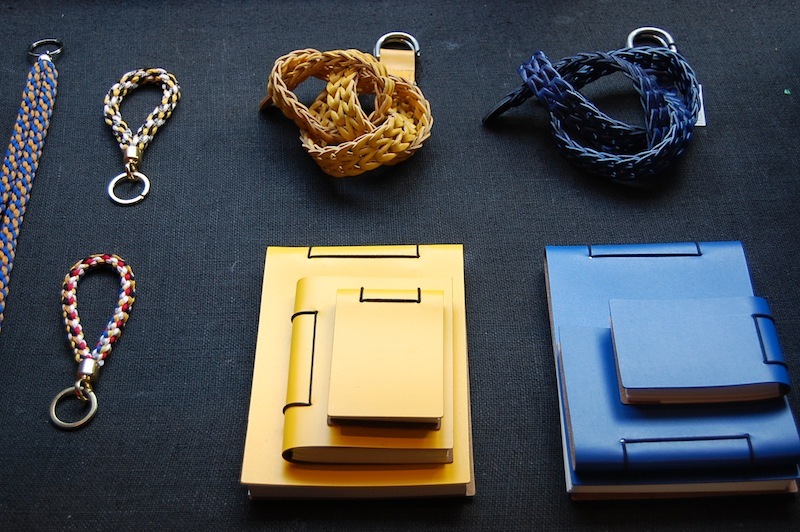 The reason for this is KZO took its name after creative director and brand founder Joel Knornschild's American-Japanese grandfather, Kazuo Iwasaki. Kazuo translates to Peaceful Man. 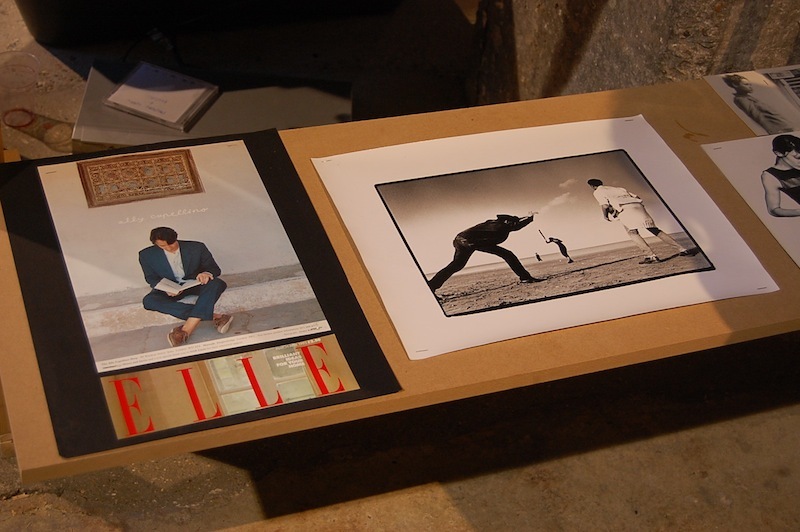 From a young age, Joel fell in love with photography, cinema and film and each collection is designed around a cinematic process that begins with a video treatment, soundtrack and visual storyboard. A video camera capturing unfolding stories always accompanies him. Fashion, music and film collided when Joel began writing and directing music videos for various bands in the US and Japan, and from there KZO evolved. The SS10 collection that drew Susie's gaze is titled 'Into the blue, out of the black' is made up of an indigo, black, blood red, heather gray, sky blue, charcoal and sky blue palette. 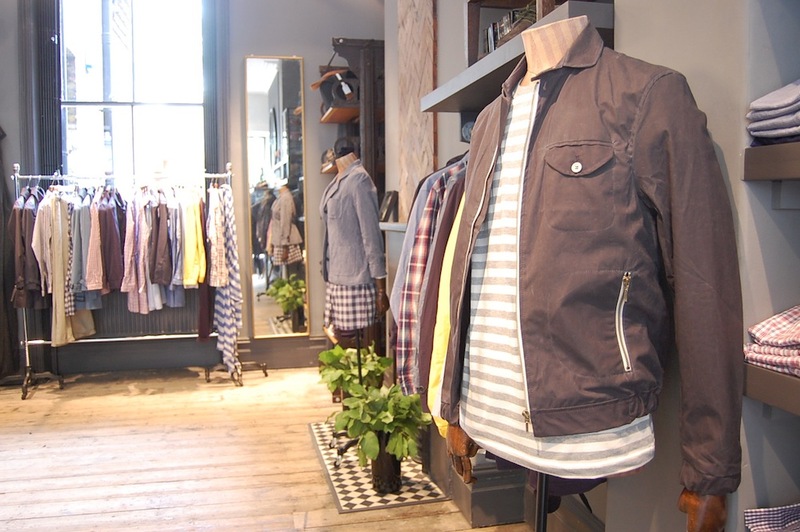 Pieces include chambray woven shirts, organic fabric knits, tom Japanese selvage denim and mosaic fleeces. However, the real highlight of the collection is the €231.08$312.87¥27878.71 soft unstructured jacket in a blue and cream cotton mix that Susie expertly picked out. Regular readers will know that I tend to avoid prints and patterns (polka dots aside) by playing it safe all too often but this is something I'm keen to work on. Having had this piece at my disposal for the last week I have to say that I've enjoyed injecting a dash of pattern in to an outfit and this present has given a little more confidence to experiment. 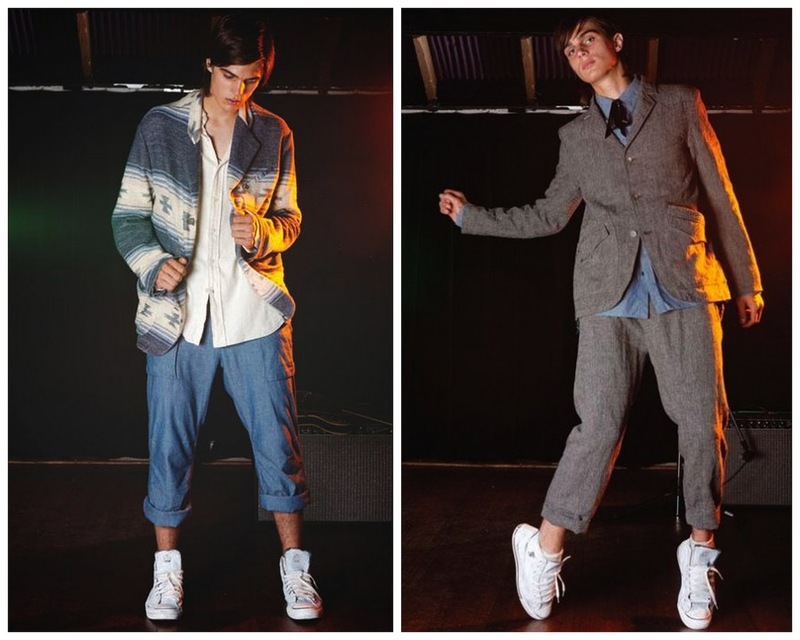 Two of my favourite looks from KZO's SS10 look book. The inviting store front on Lamb's Conduit Street. SS: How did it all start for you? What were your inspirations, your dreams and the driving catalyst behind Oliver Spencer? Oliver Spencer: It all started with some corduroy suits. 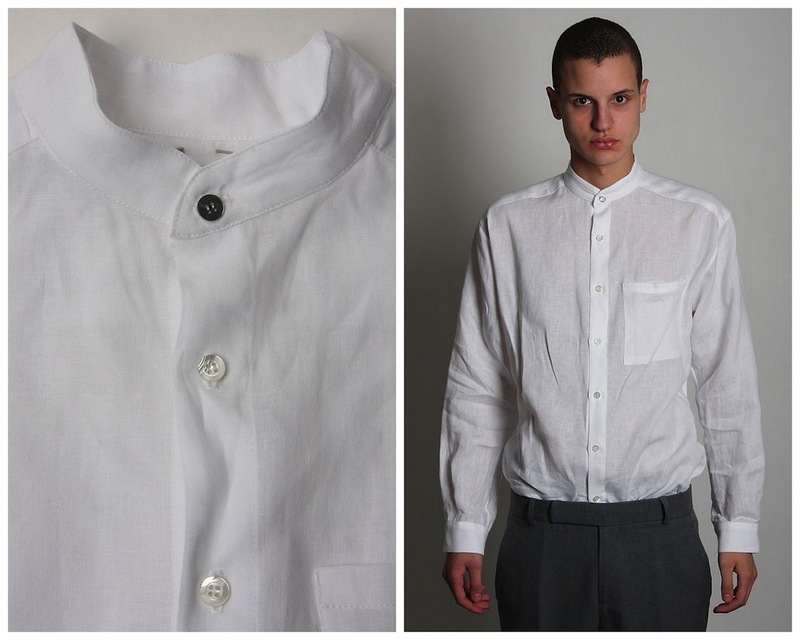 I was doing more and more work for our other label Favourbrook that was becoming more and more luxe utilitarian/casual. I like the whole un-constructed thing. At that time a dark brown corduroy suit washed, unstructured was a big turning point for me. I wore it virtually every day. SS: Aside from it being your name, what does Oliver Spencer mean to you? Oliver Spencer: It’s Englishness. I am lucky enough to have two interesting straight forward names, I think it tends to stick in peoples heads, at least we would like to hope so! Otherwise I still find it a bit weird! SS: When you founded the label back in 2002 you wanted a collection that mirrored your own wardrobe; a bridge between popular streetwear and tailoring. Does this recipe still remain? How has the label evolved over the years? Oliver Spencer: Yes this recipe does still remain. I still make everything for myself. 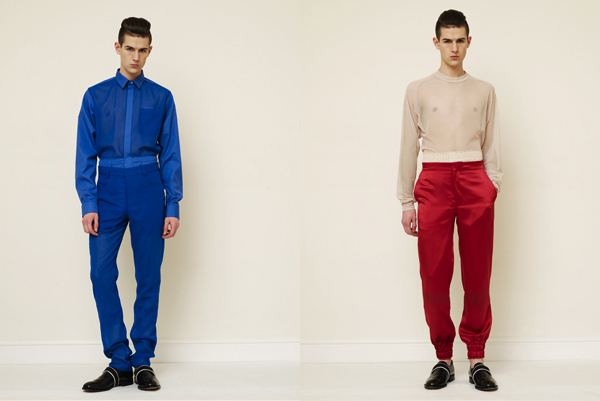 Colour has been the main influence going forward, primary colours are a big area in menswear. SS: What were the first and last item you remember designing? Oliver Spencer: First item was a waistcoat. The last was a cardigan. SS: Craft and local manufacture are obviously very important to you as over half the line is made here in the UK. You must work with some extremely small and remote factories. Is it difficult to find them and how has your relationships grown over the years? Oliver Spencer: No it is not difficult to find the factories, you just need to know how. Most of the factories that we work with, we have developed so they work to within our specifications. The main one that we use is an ex Burberry factory, so they have all the tools and the experience for the job. 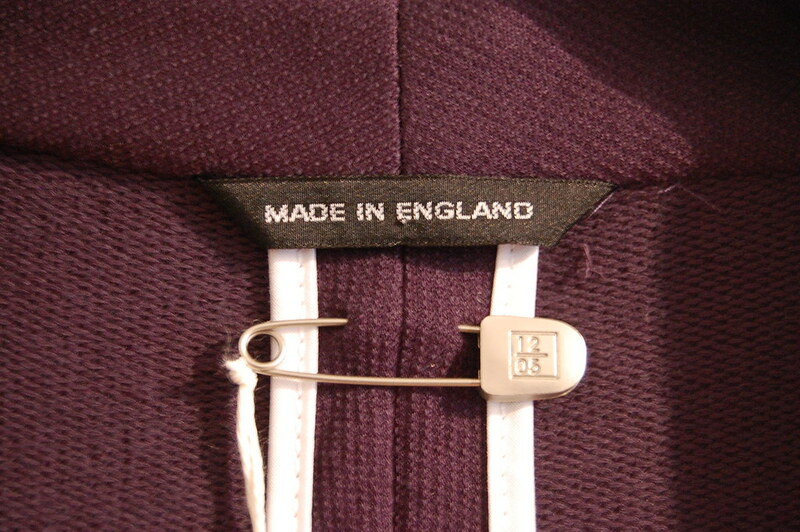 We love making in the UK. SS: Now on to your wonderful store. 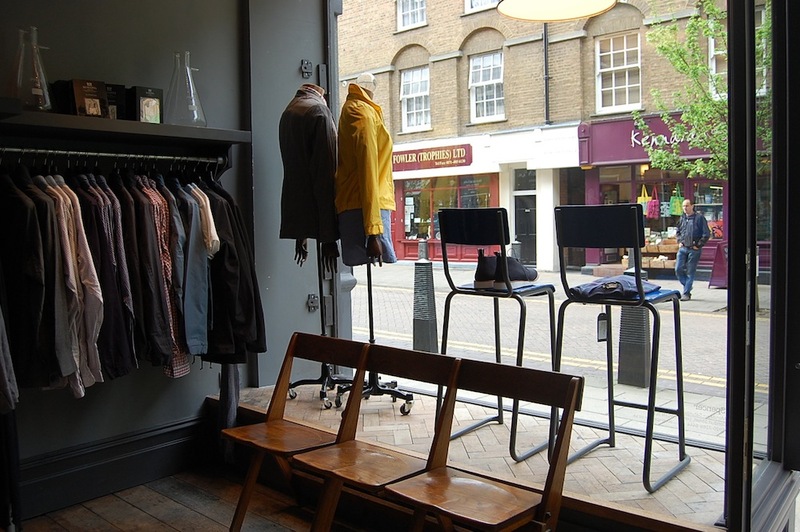 Lambs Conduit Street (as profiled by Monocle last year) shows what can be achieved in retail areas as it champions a real community spirit. Whenever I speak to brands looking for a premises of their own they often dream about this stretch of Bloomsbury. How easy was it to come by? And what, do you think, makes the street so special? Oliver Spencer: The street has great community in it, with a mix of local and professional, generally very open minded people. Key to the whole mix is three or four great pubs, which means it is a good place to go out at night too. My friend Cathal from Folk introduced me to the street and I have never looked back. SS: What are your favourite pieces in store at the moment? Oliver Spencer: Chukka Boots in blue suede with a white sole. Tennyson Red Navigator Jacket. SS: How has the menswear landscape changed since you launched the label? What excites you about the future of menswear? Oliver Spencer: Sorry to bang on about it but colour! This is the way forward for menswear. 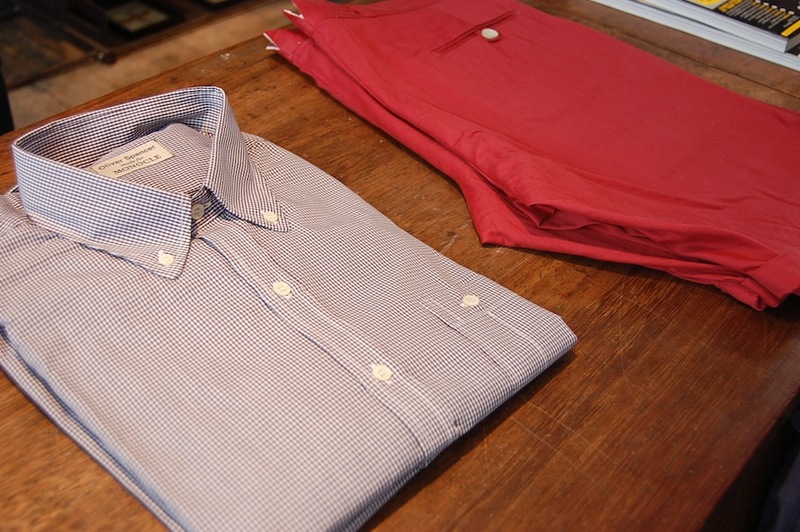 We have become more casual in the right way over the years and we use a lot of detailing. Our mantle is to be seen and not heard. SS: Collaborations are a key facet of the brand. During the last couple of weeks we've seen the unveiling of your travel shirt with Monocle and your capsule shoe collection for Topman. What have been your favourite collaborations to date? Who would you love to work with in the future? Oliver Spencer: For me collaborations at the beginning were brought to mind for Junya Watanabe for Commes des Garcons. Future collaborations, I have to think carefully about this as we get approached a lot and it is important that brand synergy is on the same playing field. All I can say is it will definitely be an English brand. SS: How do you see the brand developing over the next few years? Oliver Spencer: Footwear will develop for us. Accessories, bags and trousers I believe will be the main growth area. Oliver Spencer: Badlams Hairdresser’s on 37 Lambs Conduit Street (Bloomsbury, London WC1N 3NG). The Espresso Room on Great Ormond Street (31-35 Great Ormond Street, London WC1N 3HZ) and Café Gitan in New York. 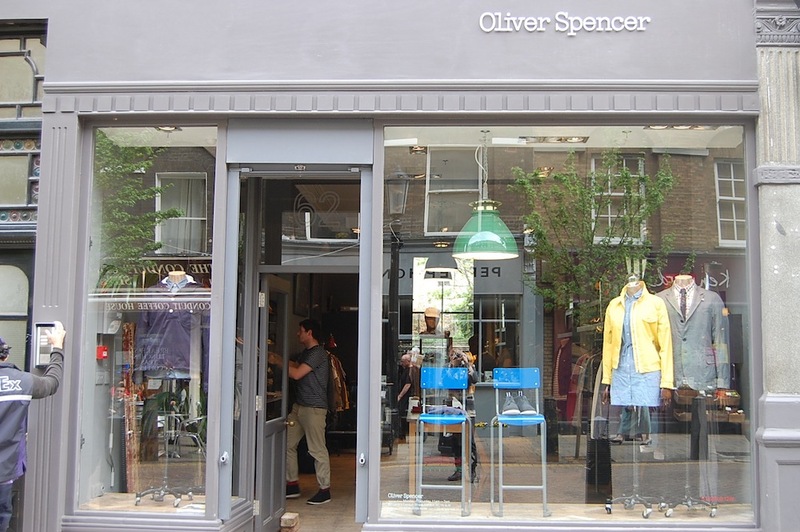 If you are ever in and around Bloomsbury you just have to stroll down Lamb's Conduit Street and pop in Oliver Spencer. 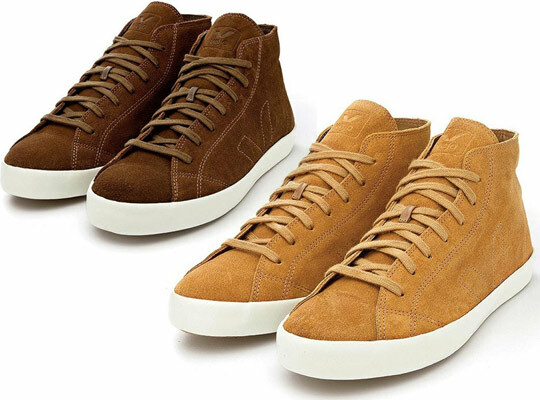 These low and hi tops are made with suede that is tanned without heavy metals or chromium with soles made with wild rubber from the Amazon. 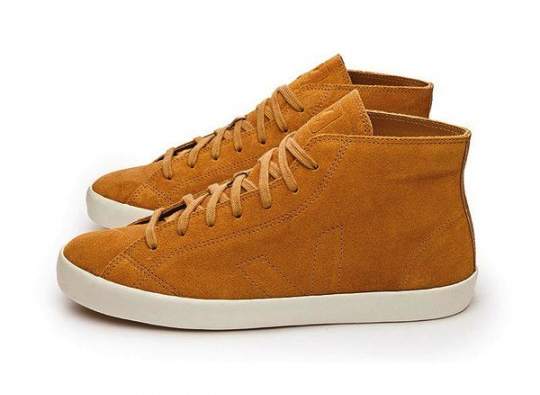 Veja produce simple, low profile trainers produced to a very high quality. With organic cotton from the Northeast of Brazil, wild Amazonian rubber and ecological leather, it is inventing new methods of work while still creating trainers with designs to get excited over. Fashion156 previewed this shot from Satyenkumar's AW10 collection just before LFW. The collection focuses around a combination of fabricated challenged tailoring of classics with a subtle element of sports detailing to create pieces which are seemingly timeless yet modern. Undeniably masculine yet with a number of subtle feminine fabrications running through it which create a featherlight collection for Autumn/Winter. Highlight pieces include a panel tailored bomber, moleskin jeans, crepe satin jogging pants, raglan and colour blocked shirts, tailored sweats, alpaca knits, Swarovski separates and my personal highlights of quilted jacquard and power net raincoats. Also, I have to point out that his pieces are exclusively manufactured in the UK using a majority of materials from British suppliers. Having seen how strong this collection was in person, I hope to see Satyenkumar take his place at the ever growing Menswear Day for SS11. "If we consider language to be not only the verbal and textural, but rather the signs with which we represent our dialectic with the world then dress is language, to which garments are the syntax. In that respect I choose my outfits, in this case my language, according to which syntax I feel helps express my feelings on any given day. I do not usually dress according to my emotions, but rather my state of mind, because it is easier and far less exposing. I tend to dress to complete images I have in my mind, which are more often than not fragments of a whole that I need to draw together and try to finish when actually dressing. It is like making a puzzle without knowing what the finished image actually is. You know from the loose pieces what the image is roughly like, however it is only when you put it together that you fully understand and appreciate what you were working towards. Then again, if nothing else, I try to have fun when dressing, because really that is all that matters!" Day One: "I woke up on a cold, cloudy and sleepy morning, and thought rather enviously of everybody else seemed comfortably tucked up in bed and under covers. It was overcast and rather grey and I knew that I would be working all day so I really wanted to go with something colourful and comfortable. I have never really been one to dress ultra dark and brooding when I feel down, and it is the same with when the weather is somewhat less than ideal. If you do ever see me wrapped up in full black and with a cloak...well it probably means that Ann Demeulemeester received my love letters and sent some clothes my way. Anyhow, it was all about bright colours to make me smile. I am rather fond of the shoes, which are actually an orange suede. Apologies for the raised eyebrow, it was a long day." Day Two: "I always feel that men overlook mohair all too easily, although admittedly this sweater is perhaps not for the faint of heart. Again it was about comfort and the experience of dressing. When considering dress you always have to keep the bodily experience of it in mind, because clothing is after all worn. Whilst I often dress in order to complete a look I have in my mind, other times it is about the experience of wearing. 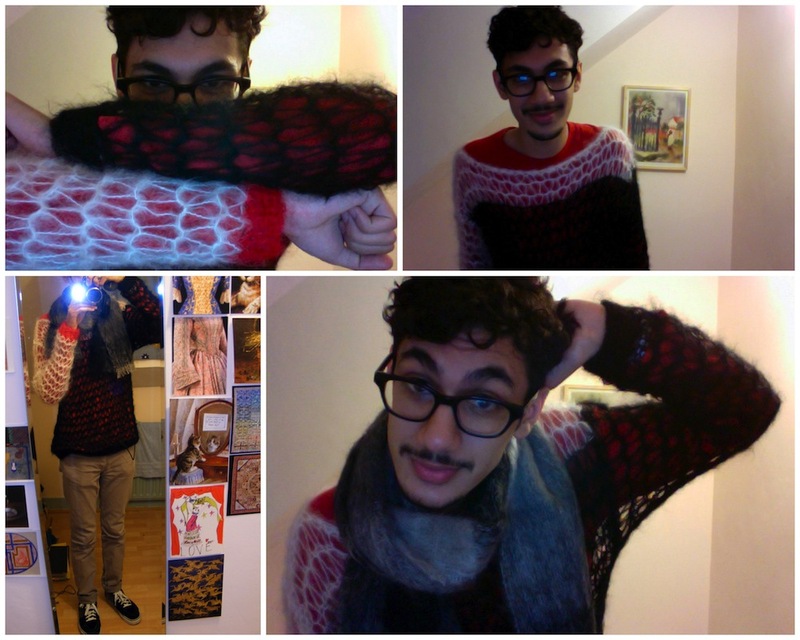 This is one of those occasions, because I went with the mohair sweater and mohair scarf just to feel cosy. It is warm, inviting and probably my version of walking down the street in sweats. The red peaking out from underneath is not actually part of the sweater but simply a long sleeve top. I like playing with colours under the loose knit, especially against the red highlight of the cuff. 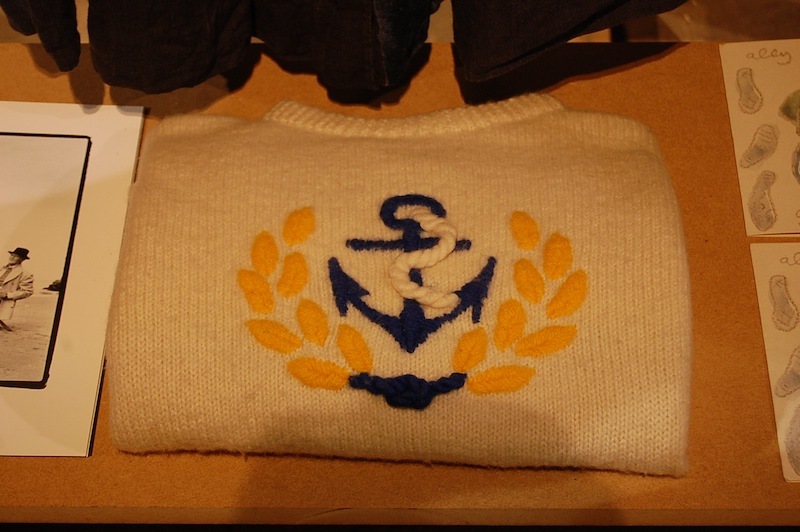 If any fashion history buffs seem to recognise the sweater design, it is actually a copy of an old McLaren-Westwood design, from their King's Road heyday." 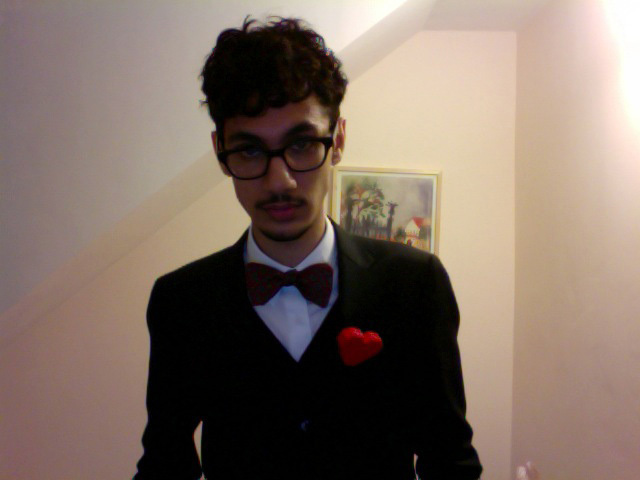 Day Three: "Photobooth is perhaps not the best tool for recording an outfit, but this was after a rather long day! I think a lot of men are scared of suits because it either reminds them of work, or they simply feel uncomfortable in them. I have somewhat of an opposite reaction, I feel at ease in the uniformity and elegance of a suit. 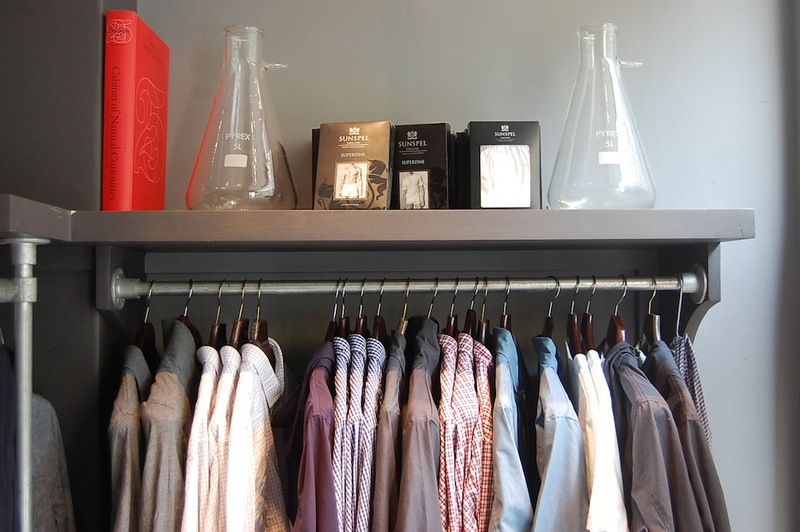 If you have a well fitting suit, you have the greatest of raw materials to build upon. You can play around with your shirts, ties and accessories with the knowledge that you suit is keeping you safe and looking good. In this case I went with a white shirt, maroon and green paisley bow tie, maroon wool cardigan, maroon paisley silk pocket square, black mohair wool suit, red socks, black brogues and a handmade lego heart brooch. I threw in a shot of me in a state of undress just because I think all men should aim to learn how to tie their own bow tie. Plus there is nothing better than undoing your bow tie and letting it hang at the end of a long day!" 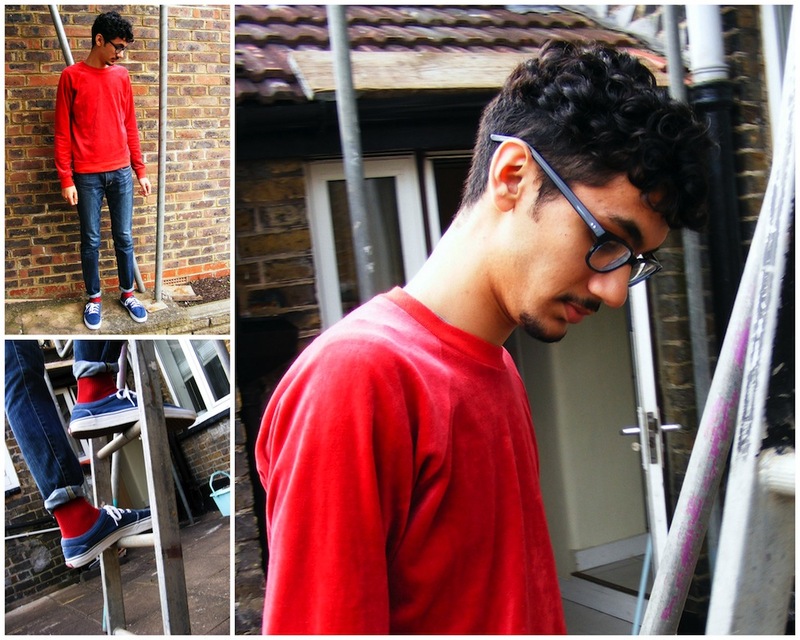 Day Four: "This was a simple bit of colour blocking. It was a bit of a challenge I set myself in all honesty. I have never felt like one of those people who are naturally stylish (whatever that term even means), so every now and again I try to dress well with just the basics. Where basics are concerned it is obviously a matter of fit, and this case was no different. The red raglan sweater is a red velour, which I bought for two reasons. The first was I loved the way light plays off the surface of velour. The second was that I ran across a store just to stroke it, and if a garment elicits that kind of a response from you, it is probably wise to buy it! I own only two pairs of blue denim jeans, and these are one of those pairs. I pegged the hems just to show off the red socks a little, as well as give a more casual look to the outfit." Day Five: "I find it impossible to buy suits - I am too tall and too skinny for most off-the-peg clothing so I am particularly fond of this suit with its slightly thinner revers. Unfortunately I felt that the black buttons were a tad off-kilter and although the pinpoint texture was nice, it still needed a little extra twist. 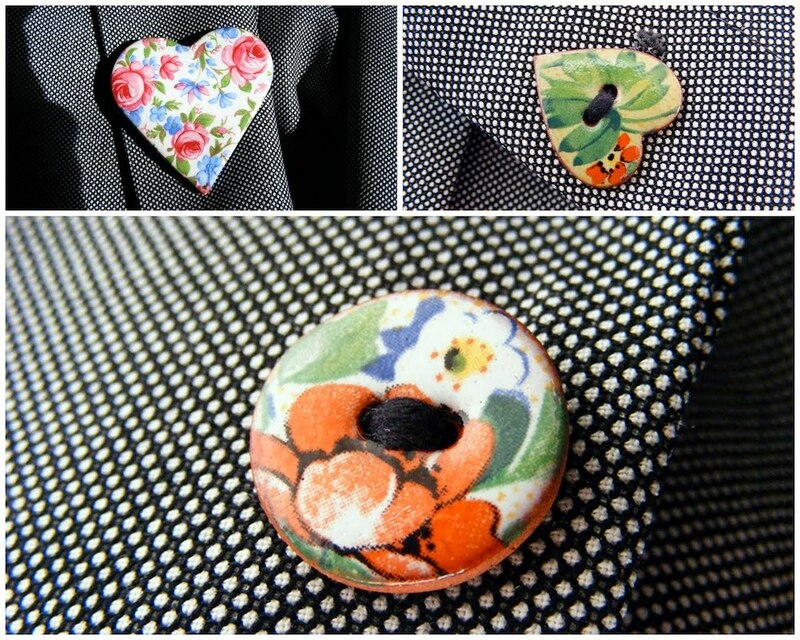 As such I actually replaced the two buttons on the front and the two cuff buttons with porcelain and enamel floral buttons that I bought from the Victoria and Albert Museum. Anybody who knows me knows my fondness for florals, and Spring/Summer is the perfect time to express that love. Indeed I went with a floral pocket square (I am actually slowly building a collection of Liberty print floral pocket squares) and a heart shaped porcelain and enamel floral brooch. I may just be slightly flower mad and have a thing for hearts, but there we are, it could be worse. 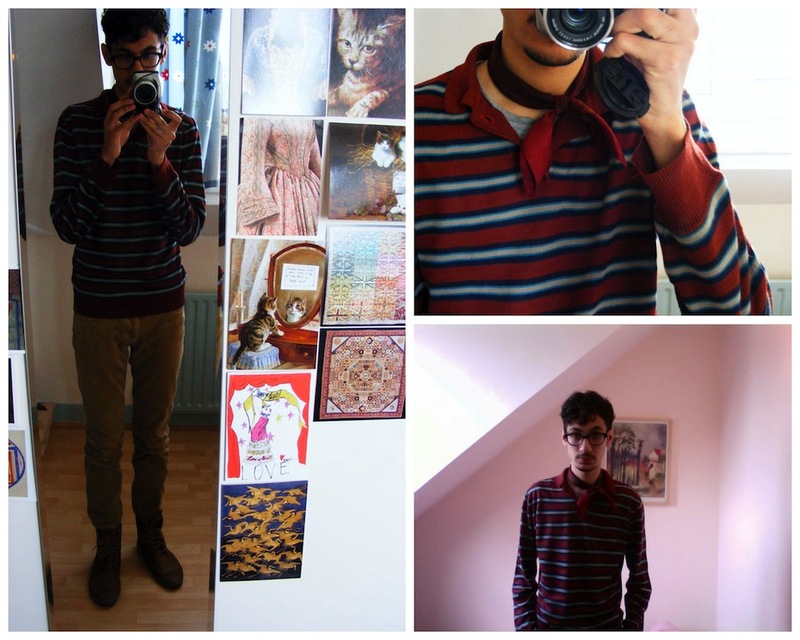 Underneath I wore a pink oxford shirt and navy wool sweater. A floral shirt would have unfortunately been overkill, however I would if I could." Day Six: "This was a running around outfit that was admittedly more Fall/Winter appropriate in terms of colour scheme and materials, however the silk neckerchief was my nod to a more summery elegance. 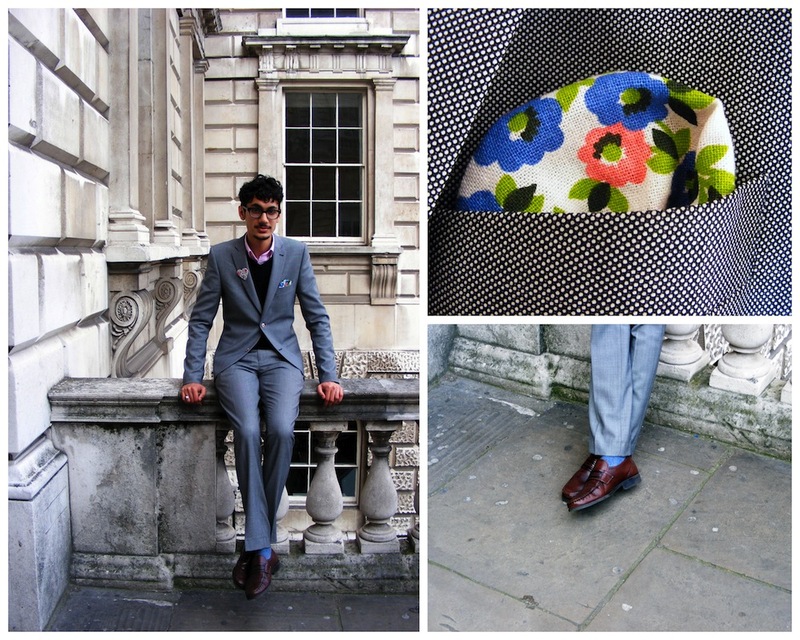 The silk neckerchief was actually the pocket square from Day Three! I am quite the fan of corduroy, although it does seem to get a bit of a bad rep because it is considered old-fashioned. That being said however, fashion is always looking to the past, and this generation's obsession with thrifting clothing is perhaps changing that association. As usual the trousers are fitted because with your general straight cut I tend to look like a scarecrow as opposed to a man in general trousers - darn my spindly legs. I tucked the corduroys into some brown brogue boots, which I wrapped and tied around my ankles rather than at their intended end. 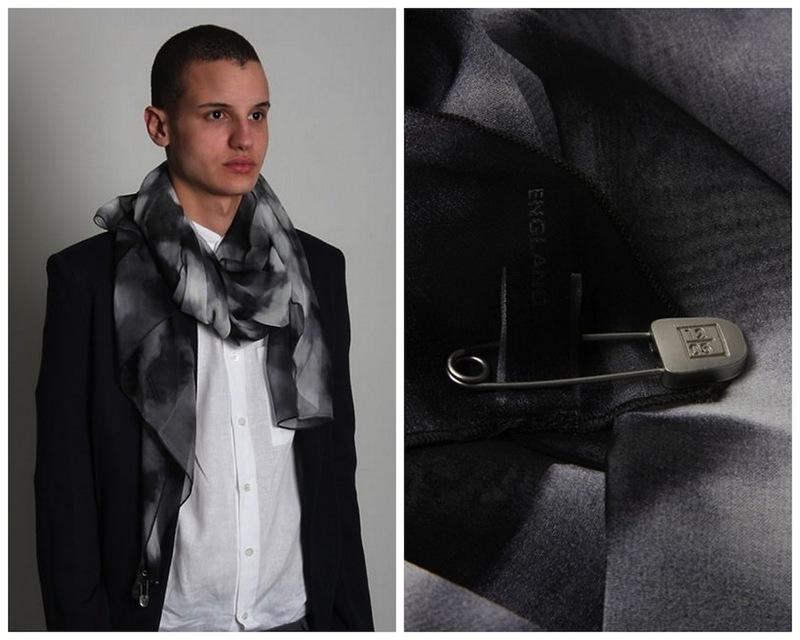 I think it is more of a street wear inspired finish, however was also practical when tucking my trousers into my boots." The Darkroom opened its doors on the characterful Lamb’s Conduit Street in Bloomsbury just late last year and since discovering it in early February I've popped in at every opportunity. 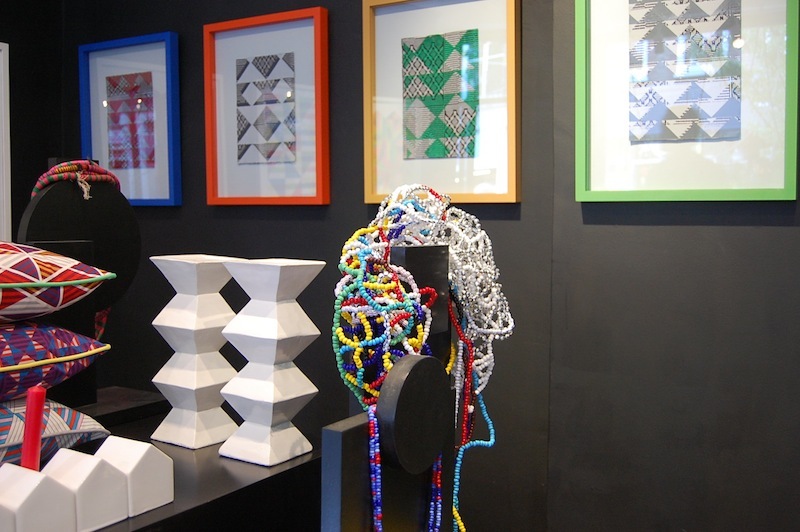 The concept store comprises a curated mix of interior and fashion accessories alongside bi-monthly art and sculpture exhibitions. This summer, the Darkroom is going colourful with their latest in-store event, titled Into Africa. Kicking off in April, the showcase explores modernist interpretations of indigenous Africa textiles, jewellery and art. Designs include a limited edition range of laptop and pouch bags by Harris Elliott, a range of hats made from vibrant Africa cotton by Noel Stewart, limited edition prints from David David’s archive of bold geometric patterns, jewellery pieces by Florian, Corrie Williamson and Fred Butler using Brie Harrison prints, as well as a range of leather wallets in vibrant colours by menswear designer Kenneth MacKenzie of 6876. As you all should know, the H by Harris line initially began with beautifully made laptop cases crafted in London from the softest leathers. 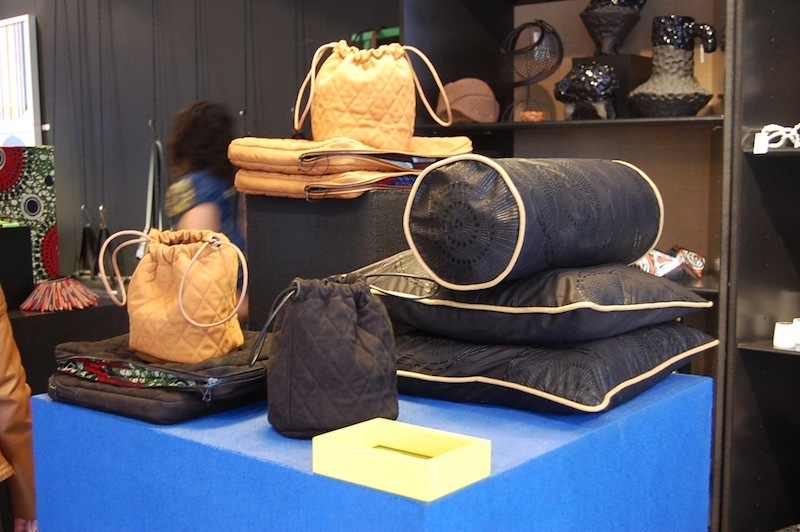 The offering has since grown and developed in to a luxury luggage brand. 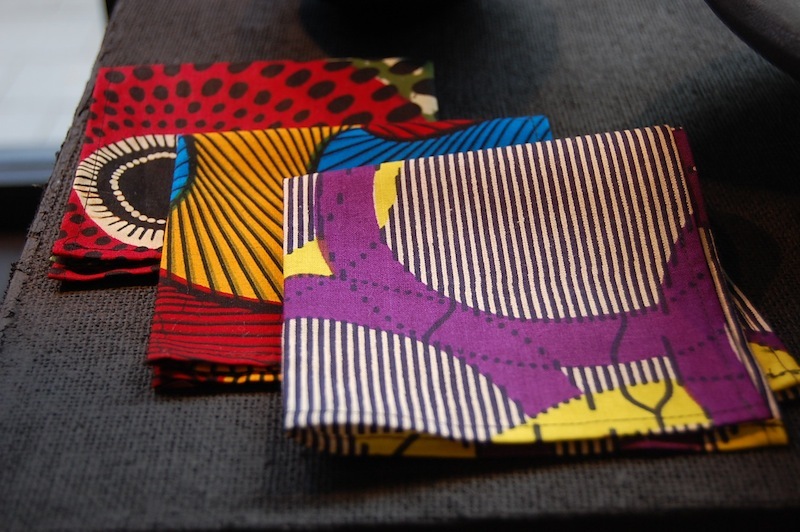 For this season, he has teamed up with the store to create one off designs comprising laptop cases and pouch bags, each lined with bold African prints. 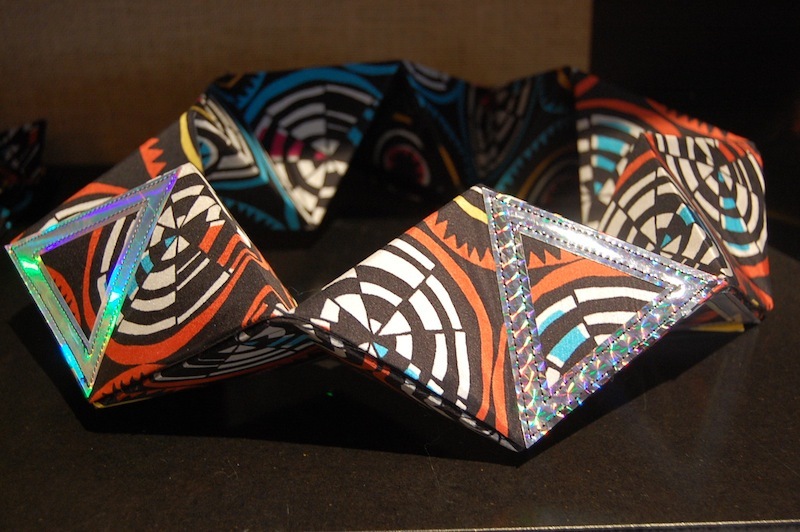 Fred Butler joined forces with Brie Harrison to develop a stunning and exclusive African print design for the Darkroom, masterfully crafted in to both neck and wrist accessories. 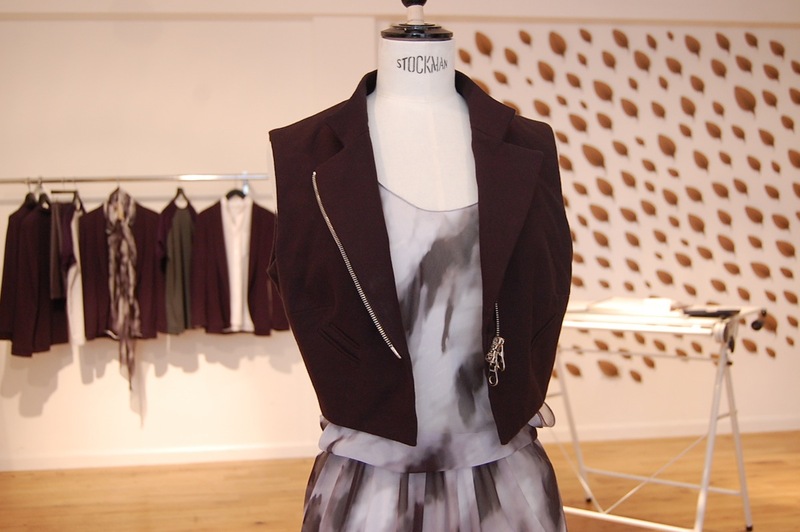 Store owners Rhonda Drakeford and Lulu Roper-Calderbeck have handpicked a selection of designs and showpieces by various talented designers, which are displayed alongside pieces from Darkroom’s own collections. As I explored the store event temptation was staring blankly at me, from Lynn Cockburn's braided belts and key rings (more on that one day soon) to Anglo's weaved belts. 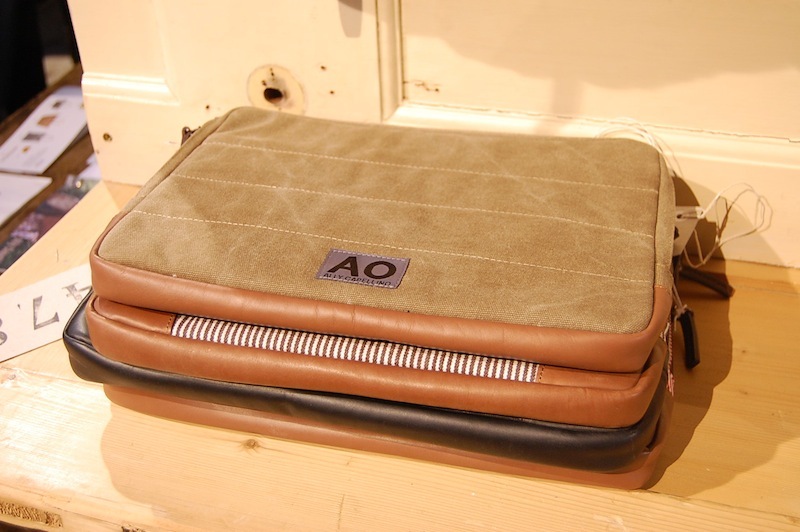 For the benefit of those of you who are unfamiliar with Anglo Leathercraft, it is a British brand and has found huge following in Japan, yet are little known in the UK. Their leather belts and bags are all made in England using the finest and most intricate leatherworking techniques. The ones seen here are ideal for the warmer months ahead. 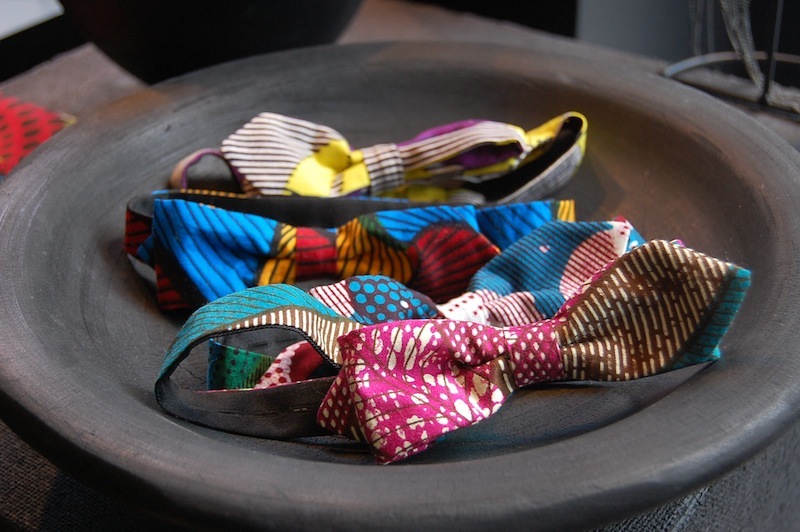 Just as I was leaving the event my eye caught sight of a bowl of colourful print bow ties and handkerchiefs. 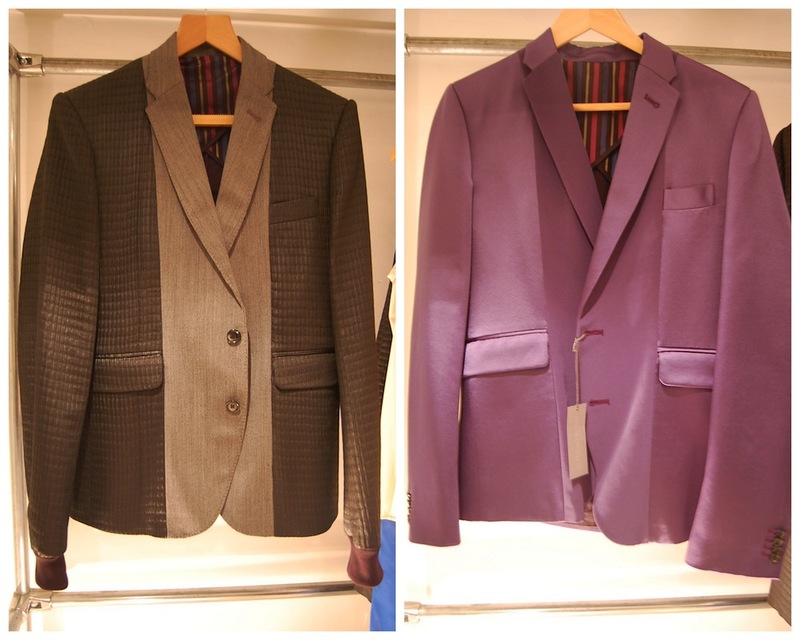 They reminded me of my temptation to give the styling of Casely-Hayford's SS10 presentation a try but before I cover my arms in eye catching hankersleeves I might just liven up the breast pocket of an old jacket with one of Darkroom's own brand printed pocket squares. These would certainly liven up any jacket. 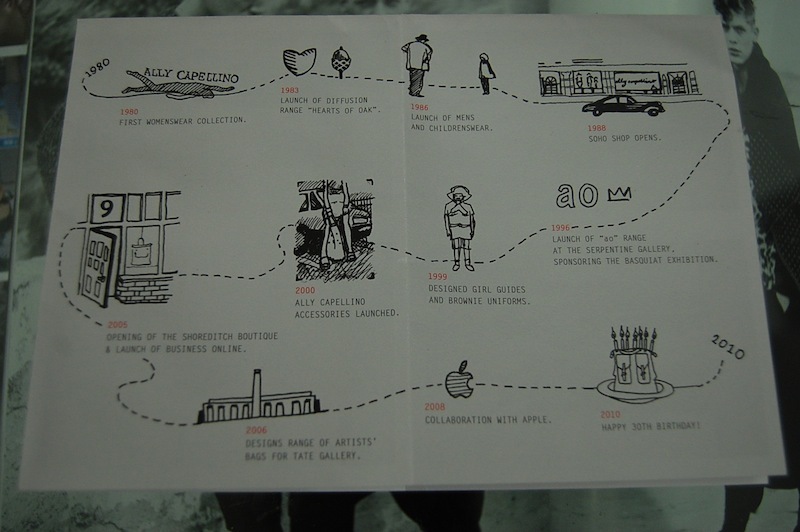 Ally Capellino's timeline is wonderful illustrated form on the leaflet I was handed upon entering the space. Notice the launch of menswear in 1986. I remember it well (I was two, ha). This retrospective was borne from the fact that their faithful client base frequently boast about having owned this or that for twenty years or more and that they can't throw it away or, in some cases are even still wearing them! From the bin liners of designs and accessories donated they have managed to create a representative line up of that illustrates the narrative of the label perfectly. 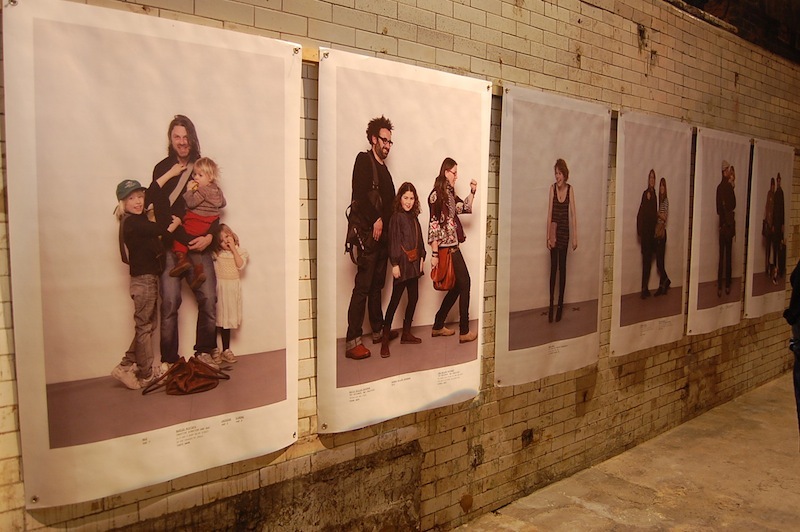 A wall of portraits depicting people and their AC's. Portraits by Donald Christie and assisted by Tom Sloan. Together with accessories from the archives, art director Rupert Blanchard has created a number of striking installations but I was particularly taken by Michelle Noel's impressive 'Wall of Bags' creation. 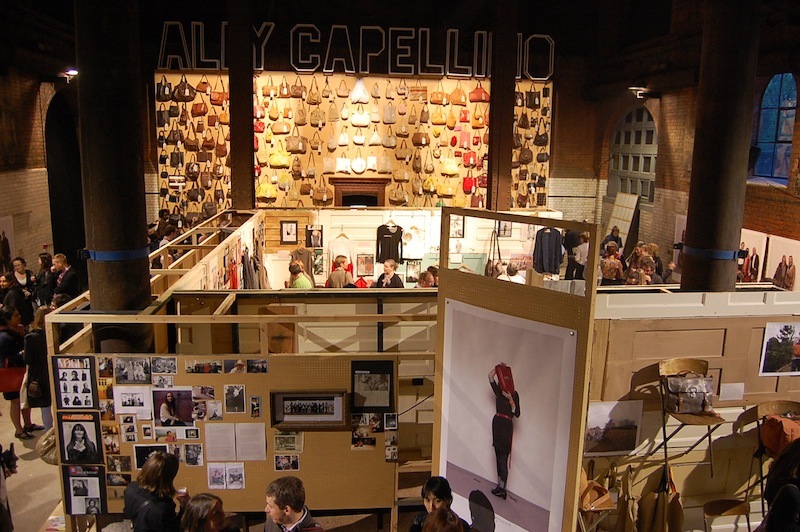 The wall is a mix of vintage, new styles as well as a number of prototypes and ideas for the future. In addition to the obvious impact of seeing them all on one wall, it is important to stress that each bag has its own story. 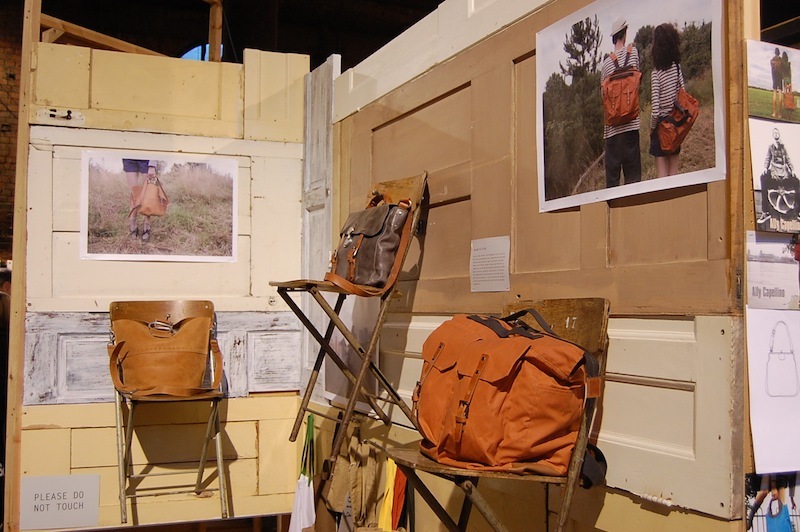 I personally love how the vintage bags have aged, the leathers and fabric get better as the years go by. My favourite piece from the AO range. The exhibition concludes with a more familiar sight (to me atleast), the timeless, but never dull, range of bags that I'd happily sell an unnecessary body part in order to own. Each piece is made from beautiful durable leathers and fabrics that only improve with age and boy do I want to grow old with them. With their quiet branding they are meant to be worn, used and loved. “People should add something of themselves, so that the bags become theirs not mine,” comments Ally. In addition to this exhibition, Ally Capellino has collaborated with Liberty to continue her thirtieth birthday celebrations. 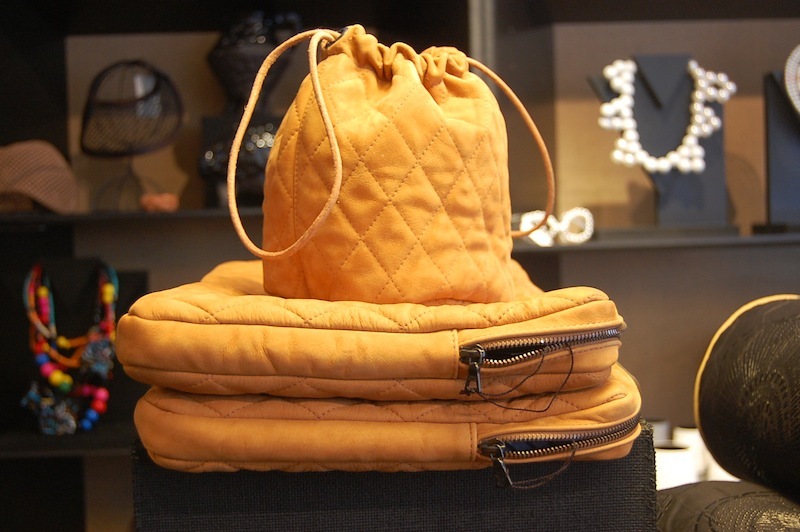 She has reworked two of her existing bags into exclusive styles for the homely department store. 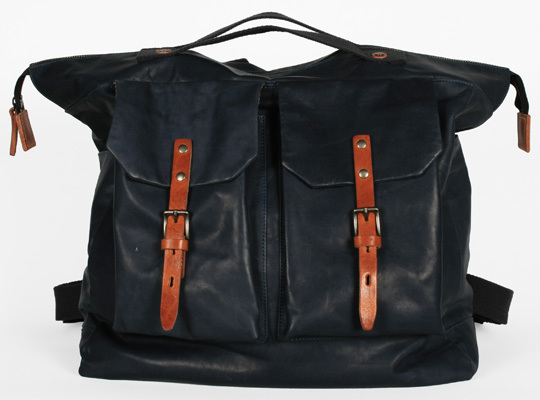 The ever popular (and one of my favourite) Frank rucksack has been produced in soft blue leather with contrasting tan leather buckles and lined with Liberty fabric. Ever since I saw it in March I've been in love. In addition to offering these bags exclusively Liberty is home to a Rupert Blanchard installation in the main stairwell. Apologies, I was momentarily sidetracked by a beautiful bag. Back to the retrospective exhibition for a moment...I urge you to make the trip to the Wapping Project if you can. The exhibition officially opens today and runs until the 6th June. If not, I'm sure you'll join me in toasting thirty years of Ally Capellino and if you are interested in seeing more from the collection then look out for an upcoming post from Susie (I excitedly shot a number of womenswear pieces and she'll no doubt want to feature the exhibition when she returns from New York).